Sometimes I want a cake doughnut, only I don't want all the work of deep frying. That is when I make these Doughnut Muffins. Like a cake doughnut, this muffin is flavored with freshly grated nutmeg and has a wonderfully rich and buttery flavor with a soft and moist texture. When they are still hot from the oven, the tops of the muffins are brushed with melted butter and dipped in cinnamon sugar. Delicious. This recipe gives you a cake-like muffin. The batter is made using the creaming method, which means the butter, sugar, and vanilla extract are beaten until light and fluffy. Then the eggs are added. Finally, you add the flour mixture alternately with the milk. 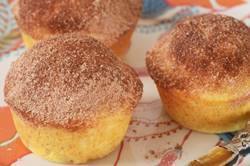 This gives you a buttery rich vanilla and nutmeg flavored muffin with a soft texture. They are similar in taste and texture to a cake doughnut only there is no deep frying involved. And, like all doughnuts, they are delicious when covered with cinnamon sugar. In order for the cinnamon sugar to stick to the tops of the muffins, as soon as they come out of the oven, you brush the tops with melted butter and then sprinkle on the cinnamon sugar. Doughnut Muffins: Preheat your oven to 350 degrees F (180 degrees C) and place the oven rack in the center of the oven. Butter, or spray 12 muffin cups with a non stick vegetable spray. In a separate bowl, whisk together the flour, nutmeg, baking powder, and salt. In the bowl of your electric stand mixer, fitted with the paddle attachment (or with a hand mixer), beat the butter until smooth. Add the sugar and vanilla extract and beat until light and fluffy (about 2-3 minutes). Scrape down the sides and bottom of the bowl as needed. Add the eggs, one at a time, beating well after each addition. Then, with the mixer on low speed, add the flour mixture (in three additions) alternately with the milk (in two additions), starting and ending with the flour. Mix only until combined. Evenly fill the muffin cups with the batter, using two spoons or an ice cream scoop. Place in the oven and bake for about 17 minutes or until a toothpick inserted into the center of a muffin just comes out clean. Remove from the oven and place on a wire rack to cool for a few minutes. Cinnamon Sugar: In a small bowl stir the ground cinnamon into the sugar. While the muffins are still warm, with a pastry brush, brush the tops of the muffins with the melted butter. Then sprinkle (or dip) the tops of the muffins with the cinnamon sugar. Serve warm or at room temperature. Can be covered and stored at room temperature for about three days. The muffins can also be frozen.